Here is my first stab at making a theme for my blog that is not a modification of another one. I have made 2 themes previous, one for the Warrior World site and then one recently for Vicomm.org. So I thought it was about time I should make one fore my own site. I have been wanting one for quite some time. Though never sat down to do it. Now I have, and I think it turned out ok. Nothing too amazing, but it has the footer style I have been wanting for a while, along with other simplifications. Please let me know what you think, or if you find any bugs. Is the textured background a bit much for the content area? I am thinking about removing it. 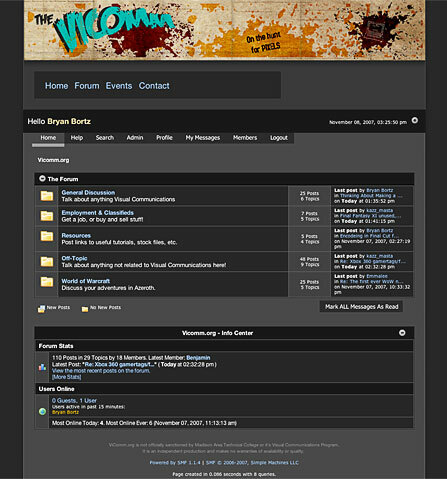 This entry was posted in Blogging, Internet and tagged Blog, Bryan Bortz, Custom, PHP, Theme, Wordpress on January 4, 2008 by Bryan Bortz. Over the past week I have been working on a new website for school. 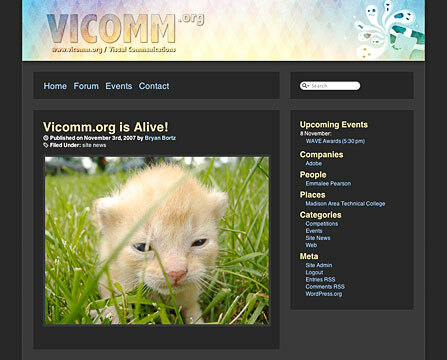 ViComm.org is a community website for the Visual Communications program at MATC.All of the site was put together by me. The banners at the top are created by various people. I am pretty proud of how it turned out. This entry was posted in Internet, Media, School and tagged Forum, MATC, ViComm, Visual Communications, Website on November 8, 2007 by Bryan Bortz. I have re-designed the Warrior World information page I had created, and made it more presentable. It will also eventually have videos of each episode I have posted too. Currently it only has a hand full. I have been playing with this off and on for awhile now, and over the past 2 days I managed to get things rolling a bit better on it. I can’t guarantee and speedy updates to the site, but I expect to get it updated when I can. This entry was posted in Internet, Media, School, Warrior World on April 3, 2007 by Bryan Bortz. List: Media I am Currently Consuming. This entry was posted in Computers/Technology, Internet, Life, Media, TV on January 28, 2007 by Bryan Bortz.